Sometimes it’s easy to get caught up in a routine and go to the same places, eat the same food and see the same sights. Traveling to the city is a hassle especially with kids and a Philadelphia road trip might be out of the question. 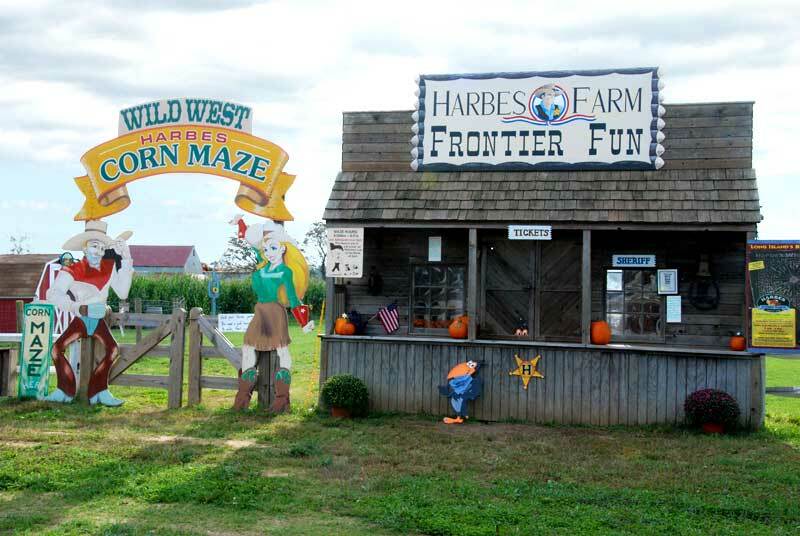 There are plenty of fun things to do right here in The Garden State for the entire family to enjoy! 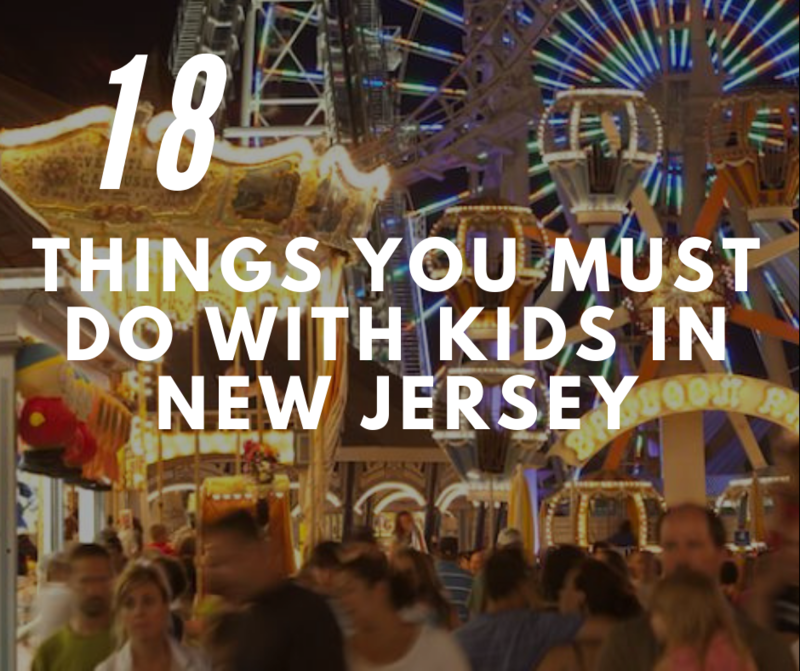 Take a look at our list of 18 Things You Must Do With Kids in New Jersey. Cheer on your knights as they battle to achieve eternal glory. Spectators 12 and under can enjoy an authentic Medieval experience for $36.95 while adults pay &62.95! Enjoy a hearty meal, beautiful horses dancing to music and some delicious food. 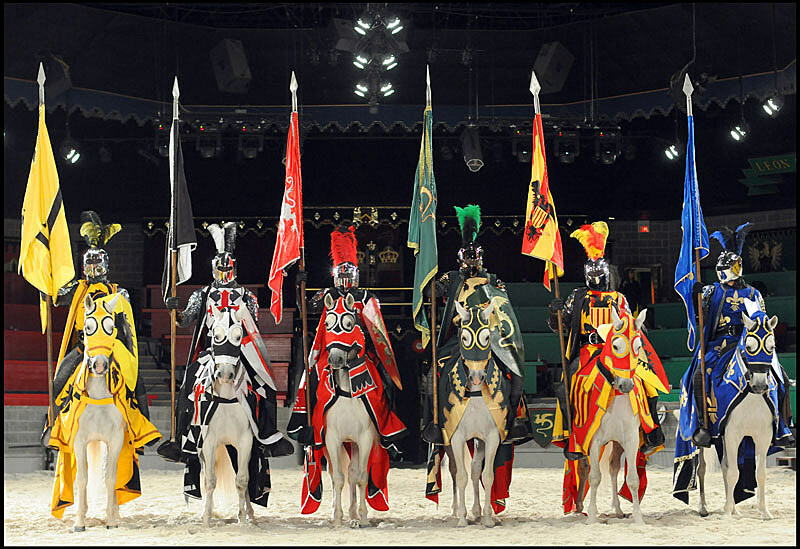 The performances, food and experience earns Medieval Times a spot on our list of 18 Things You Must Do With Kids in New Jersey! This aquarium has a reputation of being “America’s Most Touchable Aquarium.” The large aquarium is an underwater wonderland for the kids. 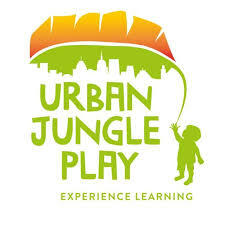 Daily activities include Shark Week, Hippo Feed and Talk, Meet the Divers and more! 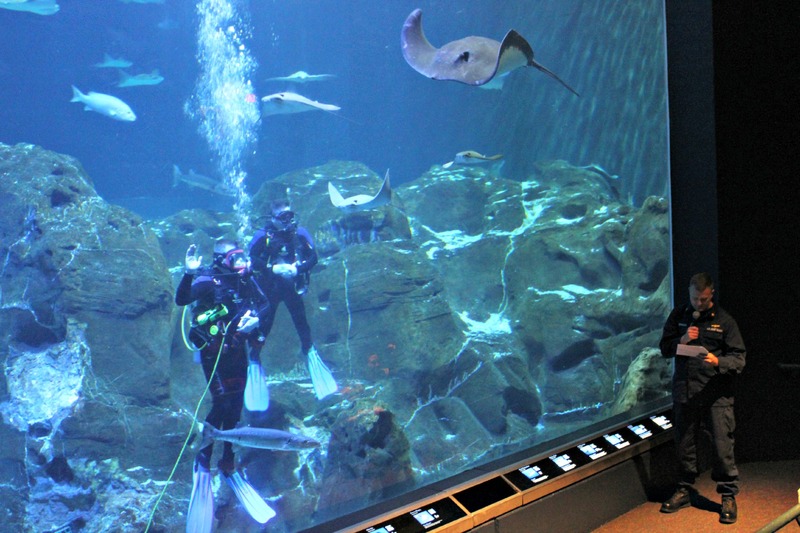 The aquarium is open year-long from 10am – 5pm. General admission is $29.99 for ages 13 and up and $21.99 for kids 2 – 12 (kids under 2 are free). There is parking located on site aquarium. It is $10 per day for general admission and $5 for Aquarium Members. 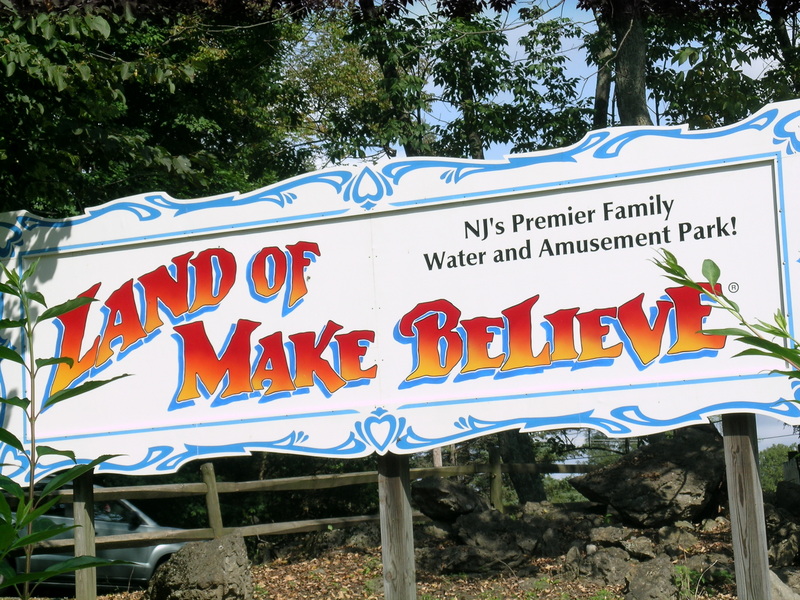 The Land of Make Believe’s founder designed & built with the dream of providing affordable family fun. This amusement park isn’t just for kids! Adults alike can take part in the thrills and chills that the park has to offer. The park is open daily from 10 AM – 6 PM and the water park closes at 5:30 PM. Adults can enjoy the day for $28. 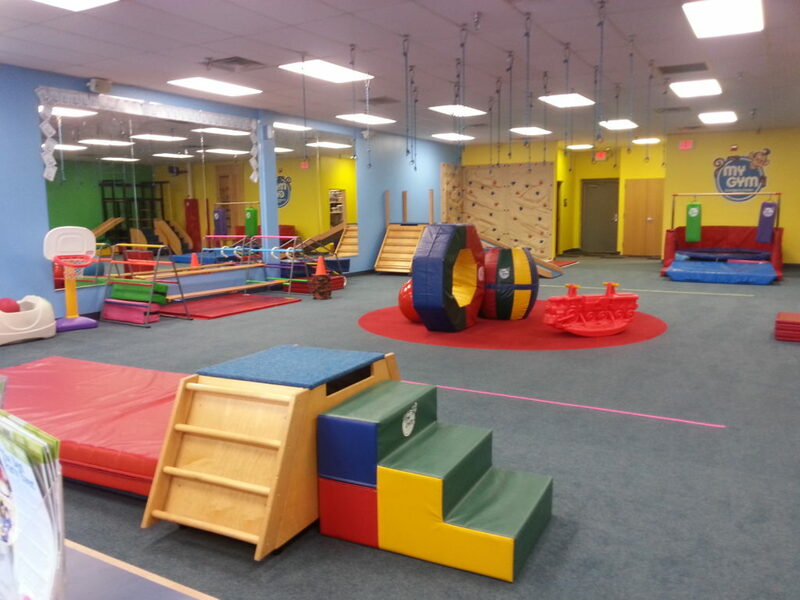 While it’s $30 for children ages 2-18 and $26 for senior citizens 62 and up! Admission covers all rides, shows, attractions, family picnic grove, and the water park! Parking is also free! Before you and your little one get to the park, you can check what rides they can go on with their height requirement guide. 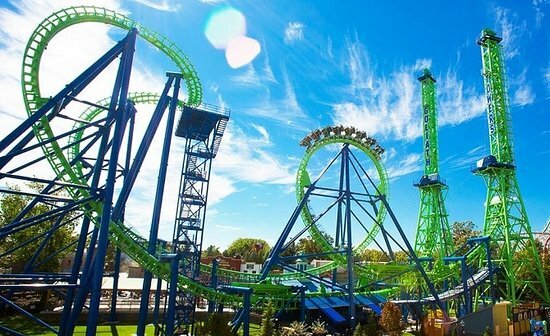 Six Flags Great Adventure is a staple on the east coast making it the perfect addition to our list of 18 Things You Must Do With Kids in New Jersey. While Six Flags has several locations, the largest one is right here in Jackson, New Jersey. Whether it’s flying like Superman, facing your fears on Kingda Ka, the tallest coaster in the world and fastest roller coaster in North America or twirling the day away on Pepe’ Le Pew’s Hearts Aweigh, there’s something for everyone at Six Flags! Ticket options include a daily ticket, gold season pass and a Six Flags Membership. Before you enter the park you can also explore the Six Flags Safari! Get ready for lions, tigers and bear oh my! Due to it’s location, Keansburg was hit hard by Hurricane Sandy which upended the park taking its historical attractions with it. In 2013 the park re-opened thanks to the great deal of teamwork! 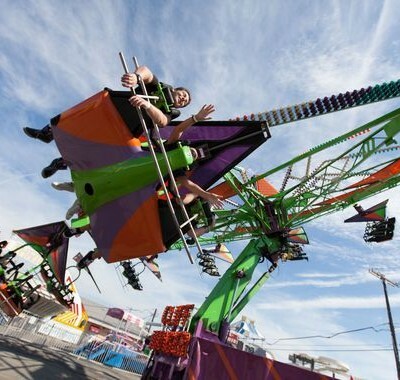 Keansburg Amusement Park offers over 40 rides including kiddie family and thrill rides. You can buy tickets individually or in books of 50-200 tickets! Have fun on a budget! Keansburg offers printable coupons for you! Take a stroll down the boardwalk at Jenksinson’s! There’s so many fun things to do for the whole family to enjoy! Win big with the boardwalk games, fill your belly with yummy treats and children can visit the onsite aquarium for just $8. If you decide to take a dive into the ocean or soak up some sun, don’t worry about the fee because the beach is free! 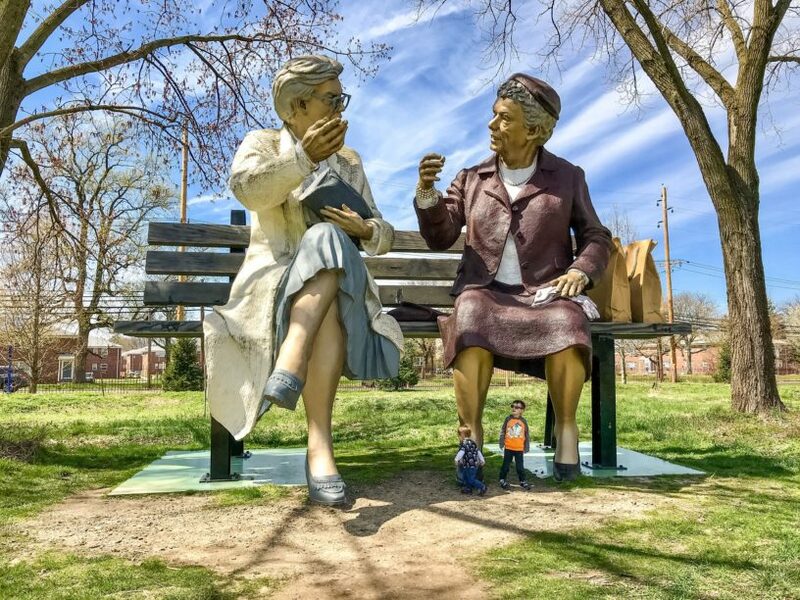 Bring the joys of reading to life which is why it earns a spot on our list of 18 Things You Must Do With Kids in New Jersey! 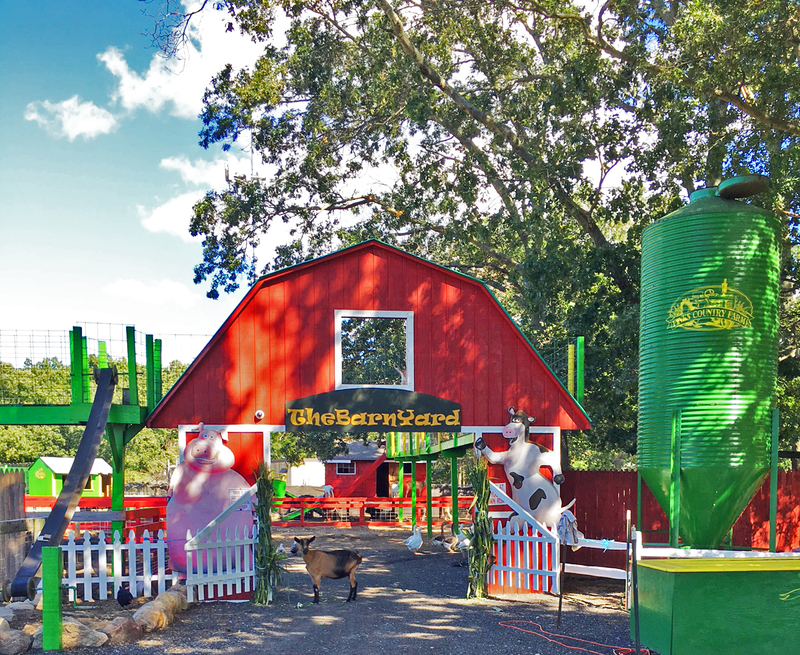 For over 60 years, since its establishment in 1955, Storybook Land has been keeping the spirit of childhood alive in an entertaining and educational atmosphere. 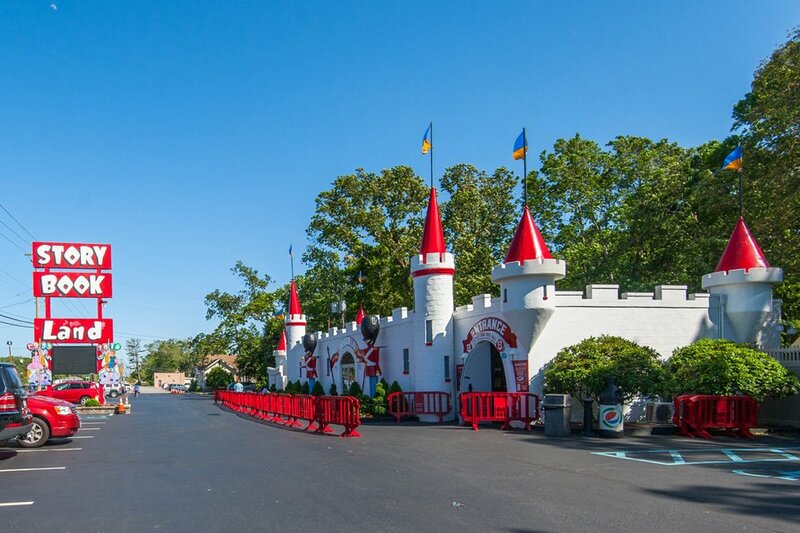 Your pay-one-price admission to Storybook Land includes unlimited rides, along with access to all of our storybook attractions! 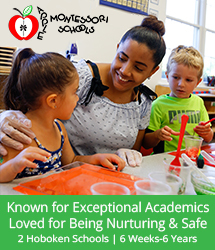 Admission for adults and children 2-64 is $27.50 and $24.50 for seniors 65 and over. 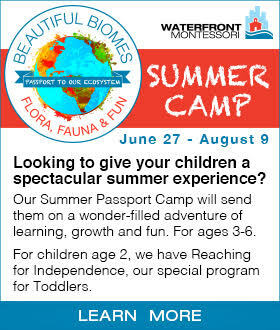 Children under 2 can enjoy this amazing storybook experience for free! This town ain’t big enough for the two of us. Only joking! 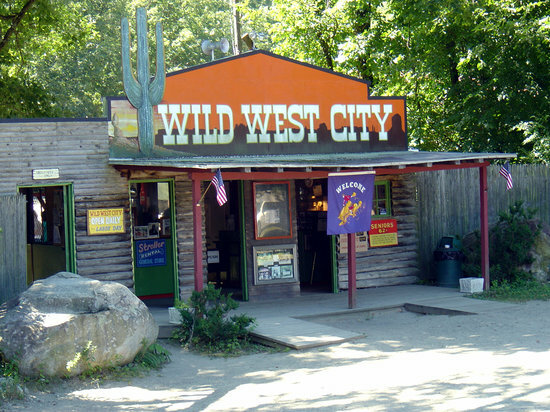 The fun at Wild West City is for everyone. 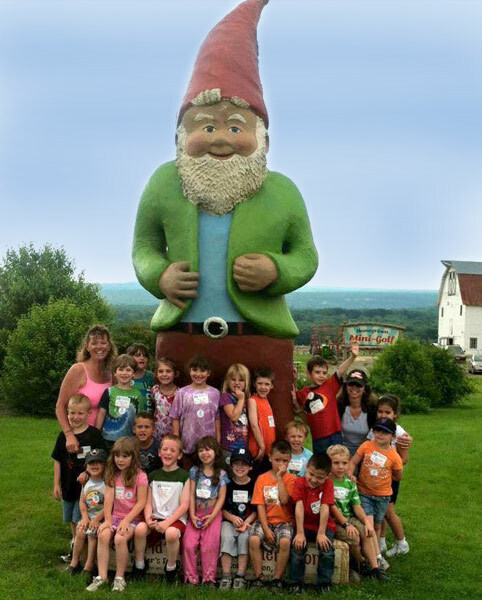 Adult admission to the park is $18, $16 for children 2-11 years of age and $13.50 for senior citizens. Ride tickers including the stage coach, train, pony ride and miniature golf are is an additional $4. At Diggerland, kids are encouraged to get messy! Pick things up and tear things down behind the wheel of a dumper truck! There are so many construction themed rides for you and your family to enjoy! 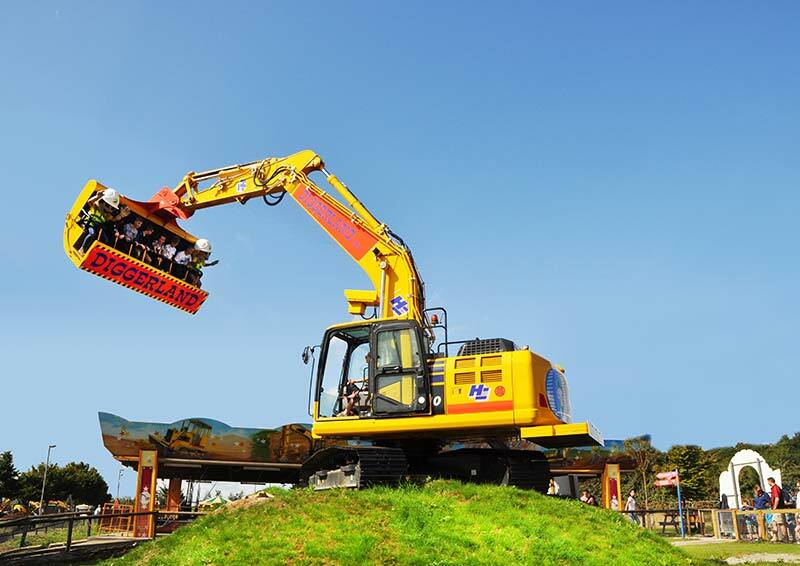 Diggerland XL, is the adult friendly part of the park allows adults to feel the thrill of operating heavy machinery. 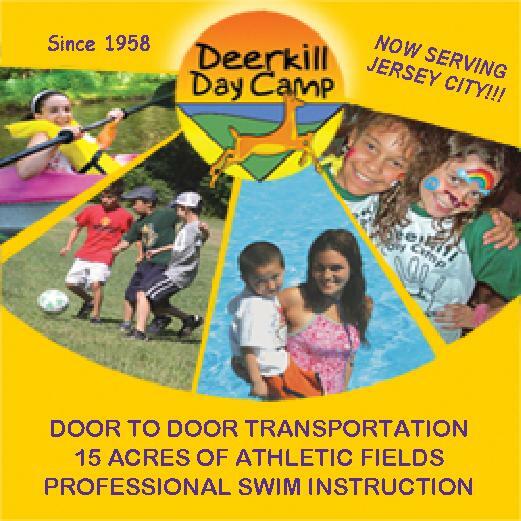 Host your next team building event, birthday party or bachelor and bachelorette at Diggerland! You can go any time or schedule your trip ahead of time! 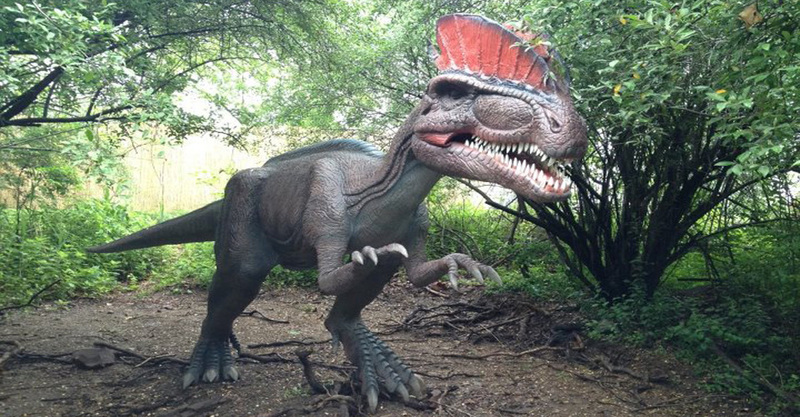 Dinosaur Field Station is the Jurassic Park of the Garden State! 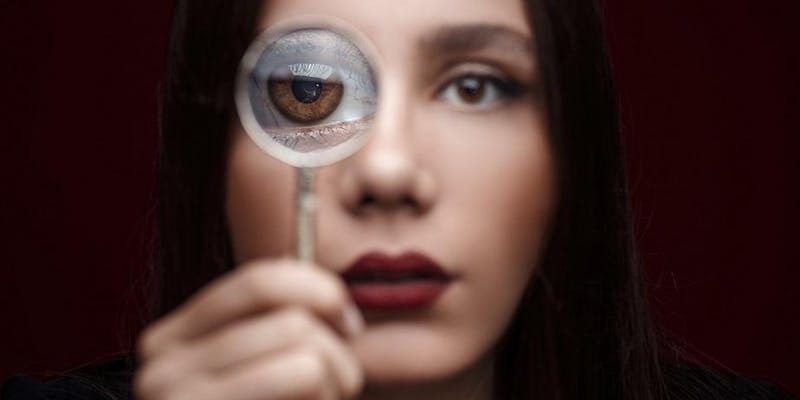 This a world-class family attraction that combines paleonthology with the creative minds of artists giving it a well deserved spot on our list of 18 Things You Must Do With Kids in New Jersey. Guests 2 and older will pay either $16.75 at the box office or $15.50 online (including a transaction fee). Guests under 2 are free. Check out the awesome things you can add-on. Nestled in the heart of central New Jersey lies Grounds For Sculpture, a magical place where art and nature are always at play. At its core are more than 270 sculptures by renowned and emerging contemporary artists, each thoughtfully positioned on meticulously landscaped parkland full of thousands of exotic trees and flowers. It is a feast for the senses. Apart from the outdoor art there are several exhibitions for you to visit. Grounds For Sculpture is open all year-round rain or shine. Admission for adults is $18, seniors $15, students 6-17 or with a valid ID pay only $10! Before you load up the car and go, make sure to call ahead of time to confirm hours and dates for each location! 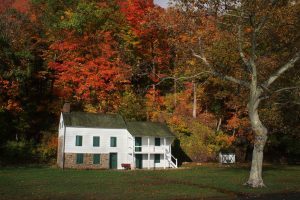 Despite being so close to Manhattan, New Jersey can stand on its own and offer so many fun things for families to do all year round! 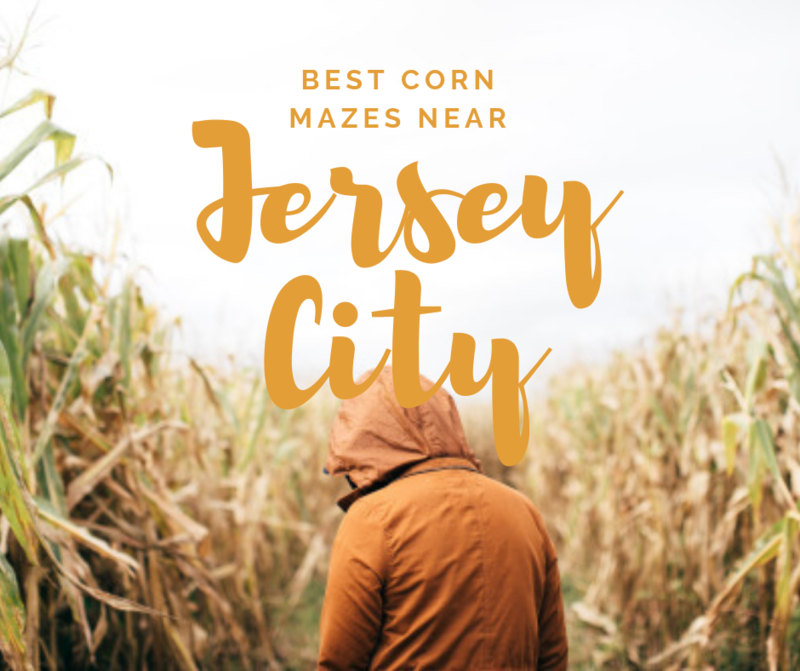 Families who live in Jersey City are fortunate to be a stone’s-throw away from many Fall activities; Drive 40 minutes away from Jersey City and find many an apple picking orchard along the road, a corn maze, or an expansive Pumpkin Patch. 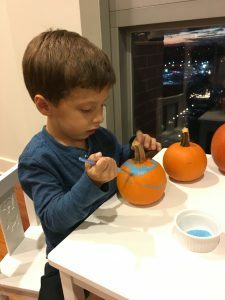 Below, you will not find a list of these typical activities, but rather a list of Best 7 Things to Do with Families Near Jersey City , that are a little less typical, but just as fun! First on the list of Best 7 Things to Do with Families Near Jersey City is a place that is 40 minutes away from Jersey City, but worth the drive. 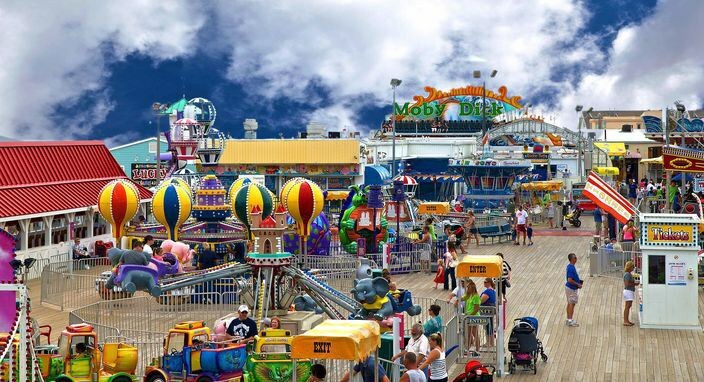 Fall is the perfect season for families to visit this amusement park; it is the closest boardwalk to Jersey City and has all of the bells and whistles that the other more popular destinations have to offer. 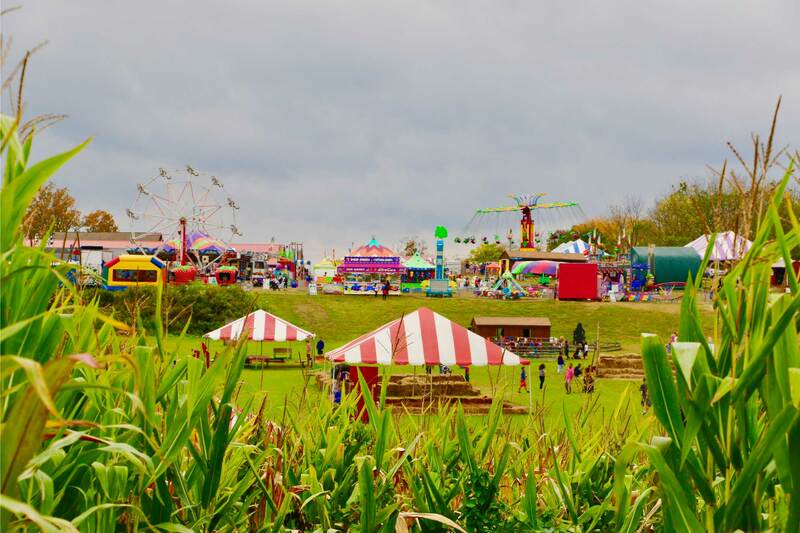 From go-carts to toddler rides, and even a thrilling roller-coaster; this amusement park is not crowded during the off season, and fall temperatures make it the perfect for families to enjoy a day-trip. 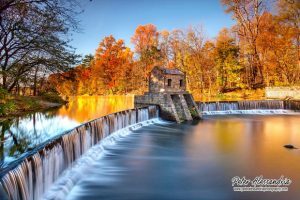 Be sure to check their fall hours here before you leave home, as they may not be open in inclement weather, or if there are too few people at the park. Also, if a ride looks like it’s not working, simply ask for an attendant and they will operate it for you. 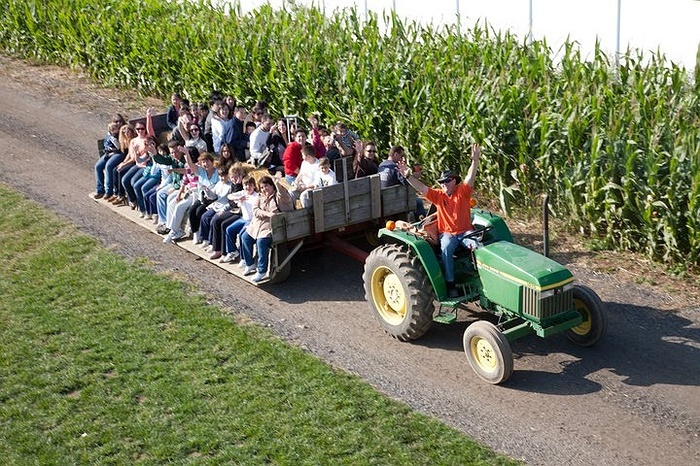 What better way to visit an amusement park than for families to have a ride all to themselves? 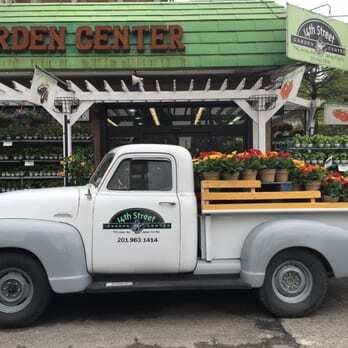 Approximately 30 minutes from Jersey City, this is not your mother’s farmers market, and is not to be missed. 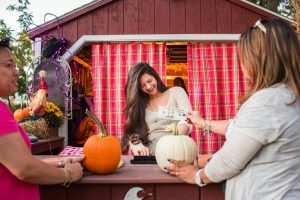 The market’s size and variety make it unique among farmers markets and earn it a spot on the list of Best 7 Things to Do with Families Near Jersey City This Fall. This market boasts abundant fall produce, arts and crafts, and delectable food cooked on the spot. Even the furry four legged members of the family will find something to eat (dogs are allowed and encouraged). 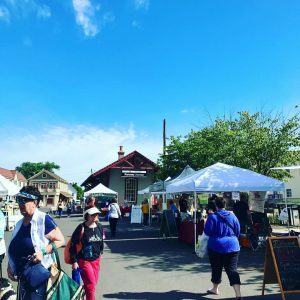 In addition, the market is located next to an historic train depot and small museum, that will be surely pique the interest of young family members. Yes, Jersey City has its own market, but this one is worth the short drive every weekend through November. 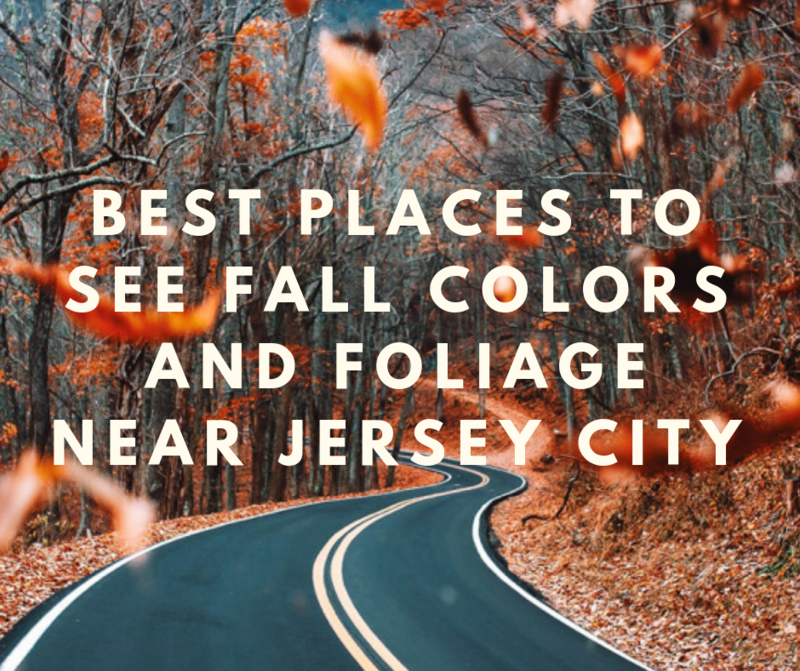 A list of 7 Best Things to Do with Families Near Jersey City this Fall, would be incomplete without this local Jersey City destination. What’s the best time to visit? Hands-down, the answer is, in the fall! What compliments picturesque views of New York City and Harbor? 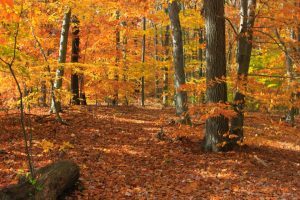 Why fall foliage of course, and cool refreshing temperatures. The playground alone, with its vast and accessible structures, and panoramic New York City views would be enough to make this trip worth it any day. All of this, plus fact that it is only 10 minutes from Downtown Jersey City, are more than enough to make it on our list. 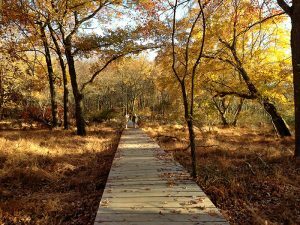 Be not discouraged if you have been here many times already, there is more to be discovered: For example, the Richard J. Sullivan Natural Area offers several nature hikes along its well-preserved estuary that are walk able even for the youngest members of the family. 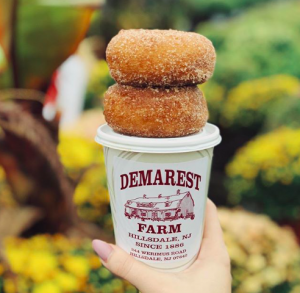 With a plethora of farms to choose from this fall, there is a certain ‘je ne se qua,’ and charm about this farm that distinguish it from others, perhaps its charming placement on a picturesque hillside, or the scent of fresh made doughnuts mingled with warm apple cider, both made from scratch on the premises. 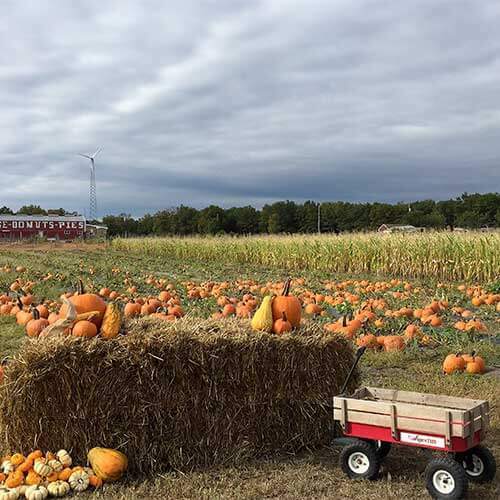 Whether the petting zoo, or the picturesque hayride, Demarest is one of the best things to do for families near Jersey City this season, every member of the family is sure to be pleased! Not to mention, it was named by the Huffington Post as “one of the best places to pick Apples in the US”. Needless to say, it is worth the 30-minute trip from Jersey City. 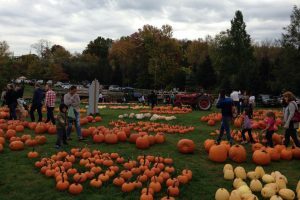 Not only is it a standout farm, but easily makes our list of the Best 7 Things to Do with Families Near Jersey City this Fall. 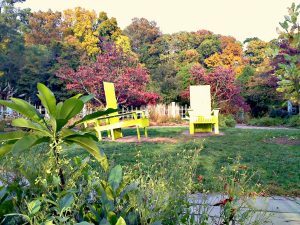 Approximately a 40-minute drive from Jersey City, the picturesque botanical garden makes the list of our Best 7 Things to Do with Families Near Jersey City this Fall, not only because of free admission, but because of its many flower-lined paths; the perfect antidote to the crowded streets of downtown Jersey City! 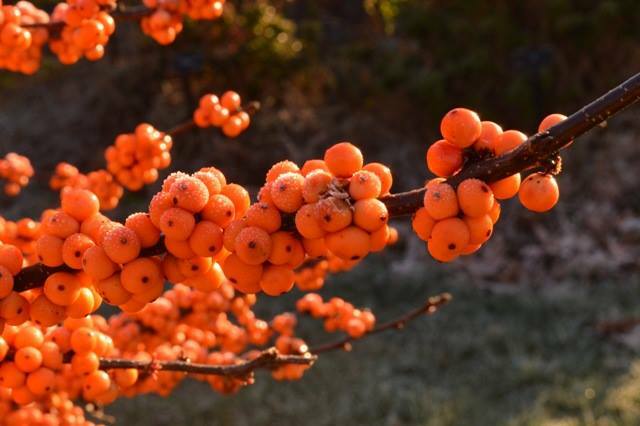 Fall at Rutgers Gardens renders spectacular colors and unrivaled foliage. 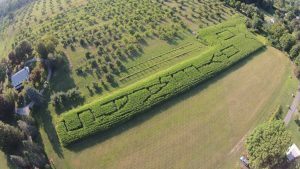 There are secret spots for picnics, Frisbee throwing, and perhaps a family game of hide and seek. 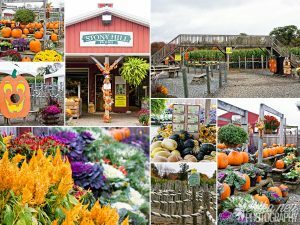 This Union County gem makes the list of Best 7 Things to Do with Families Near Jersey City this Fall because well, it is brimming with live Turtles! It is relatively unknown to Jersey City residents, but it should not be! 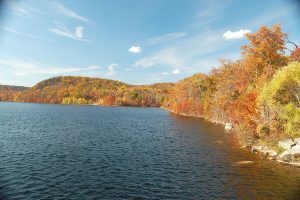 It’s unique and charming and About 35 minutes from downtown Jersey City, Echo Lake Park is full of things to do for families at any time of the year, but the backdrop of fall foliage only makes them more enjoyable. 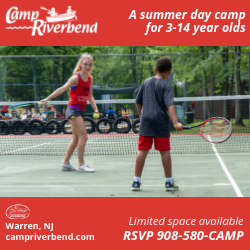 Activities for families include paddle boating, (through October), hiking trails, a playground, and walks around a waterfall and large stream, (that boasts turtles and fish). 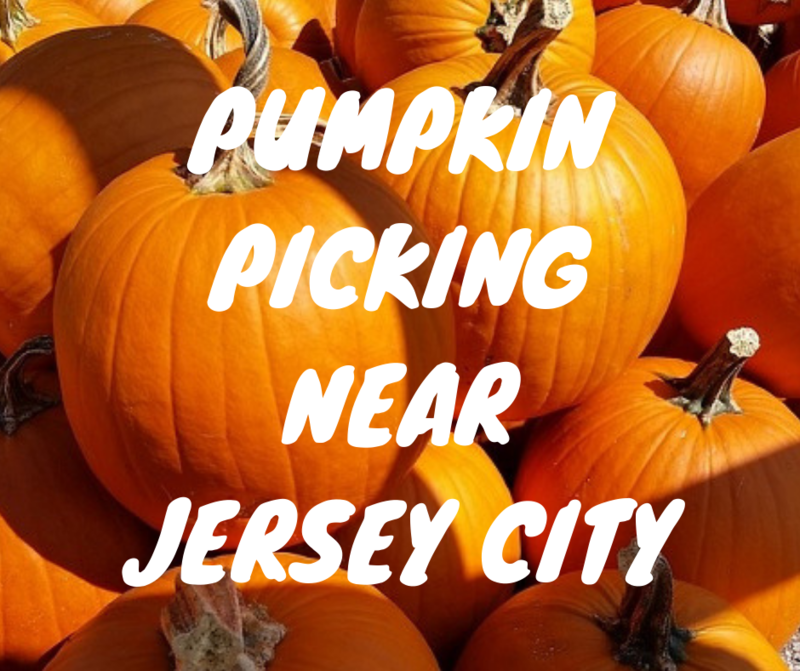 This is definitely one of the 7 Best Things to Do With Families Near Jersey City this Fall! 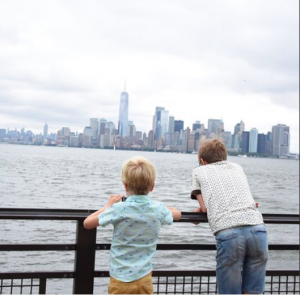 This well-known, but perhaps under-appreciated park makes our list of Best 7 Things to Do with Families Near Jersey City This Fall, simply because it offers some of the best views in the Northeast. 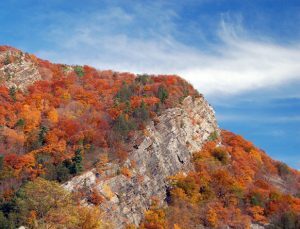 Even more, the area is surrounded by tree-lined cliffs that paint an indelible and beautiful picture. It takes about 30 minutes to get here from Jersey City. 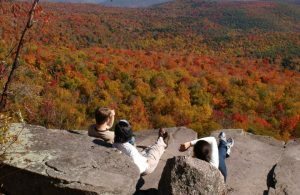 In addition to the views here, there are a plethora of things to do for families, adaptable for any age. 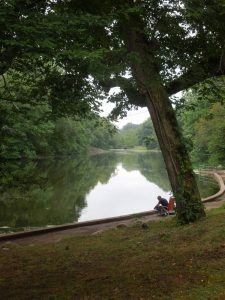 The vast greenery of ‘Ross Dock Picnic Area,’ perfectly perched by the foot of the George Washington Bridge for example, will help to quickly erases any memory of crowded Jersey City streets. Or for the ornithologists in your family, check out the annual Hawk Watch from September to November. 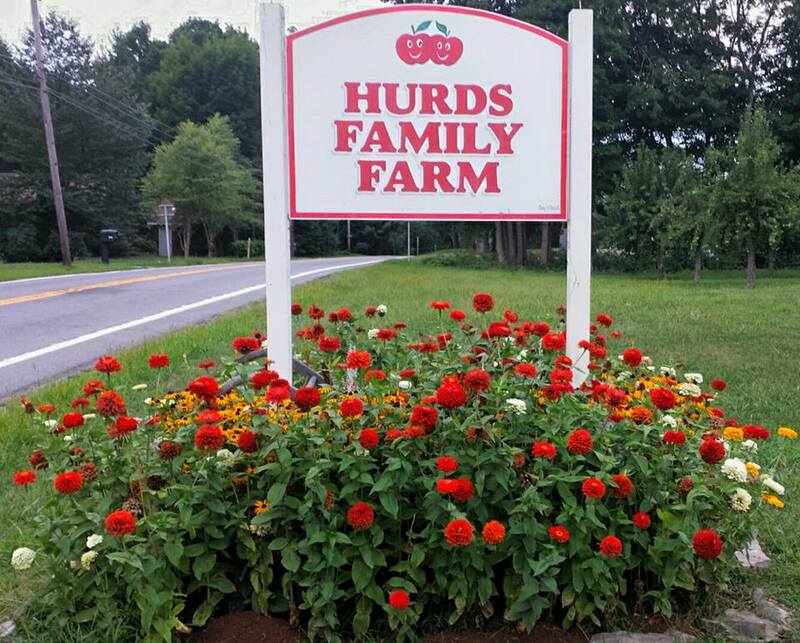 Now that it’s October, maybe already had your fill of Apple Picking excursions. Perhaps you have enough pumpkins in your house to last a lifetime. 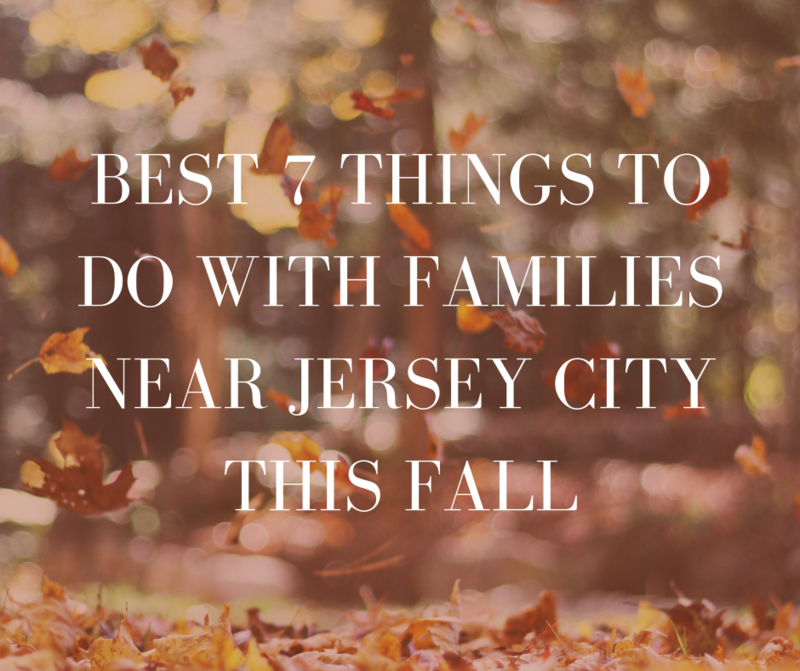 If any of that sounds familiar, consider our list of Best 7 Things to Do with Families Near Jersey City This Fall. Let us know what you thought! Ah Autumn! 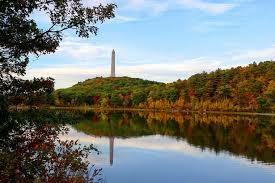 The leaves begin to change colors, the weather calls for our favorite sweaters and pumpkins and apples need picking. 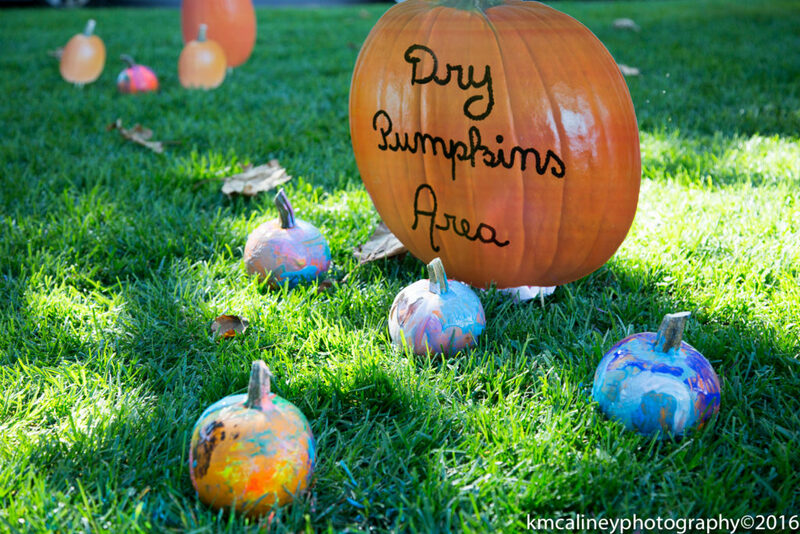 The days may be getting shorter, but that doesn’t mean the family fun has to stop! 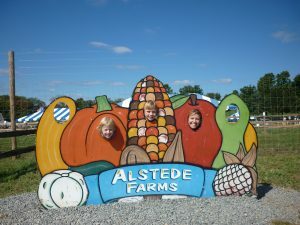 Fall is packed with events that the whole family will enjoy. Don’t know where to start? No problem! 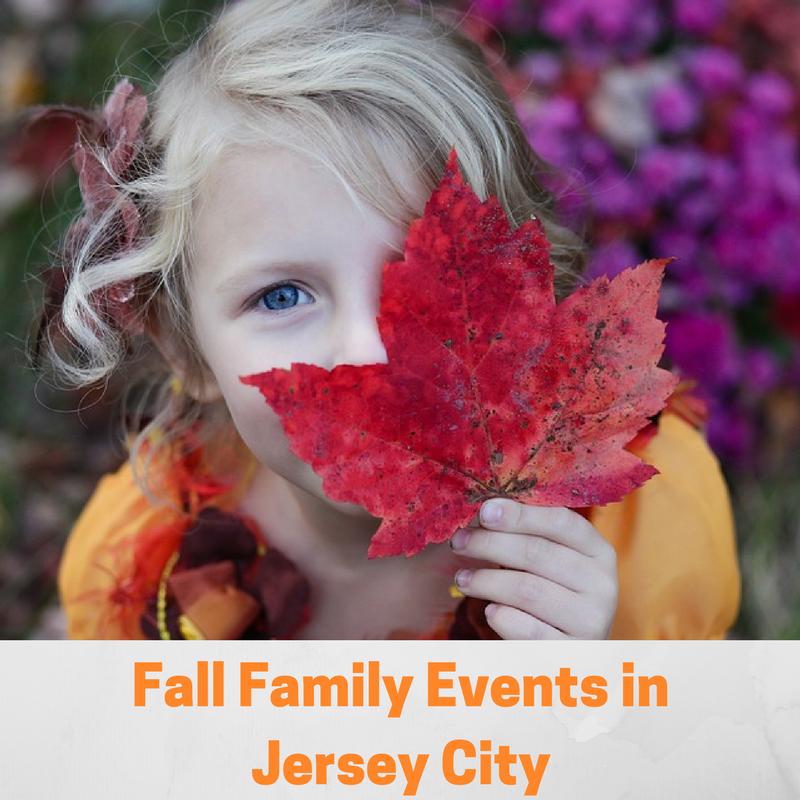 We’ve created a list of Fall Family Events In and Around Jersey City just for you! Head over to Pier A Park at 100 Sinatra Drive and enjoy a day full of fun at the Hoboken Harvest Fest! 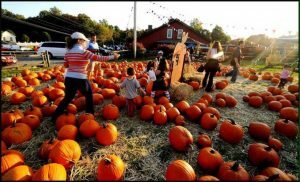 You and your family can take part in free activities including pony rides, a petting zoo, pumpkin painting, hayrides, music and crafts! Food vendors will offer tasty delights for purchase. 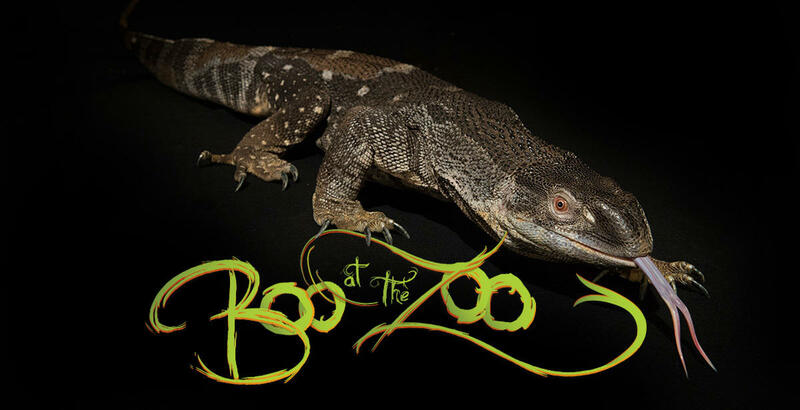 Boo at the Zoo returns to the Bronx Zoo, located at2300 Southern Blvd Bronx, NY. Enjoy a new line-up of activities including a pirate hayride adventure, magic show, extinct animal graveyard, pumpkin carving, a costume parade and more! Jersey City celebrates the 4th Annual Parade of Veterans and Heroes. The parade will march along the Newark Avenue side of Dickinson High School and conclude in front of City Hall. The event will include many parade floats, marching bands, military vehicles, local ROTC cadets, color guards, active and former military personnel from all branches of the armed forces, VFW members, AMVETS, and other organizations that support and honor our veterans and heroes. With nearly 2,000 participants in the 2016 parade, it has quickly become NJ’s premier destination parade in honor of those who keep America safe and free. Games, crafts, music, seasonal cooking demonstrations makes for an afternoon of seasonal fun at this eagerly anticipated fall festival! 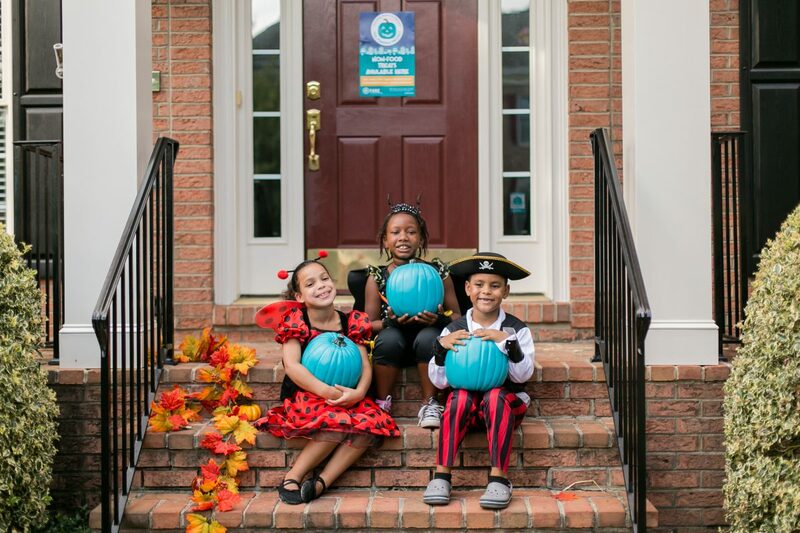 With Halloween right around the corner, families can explore the Spooky Trail, show off their pumpkin decorating skills and join the costume parade. 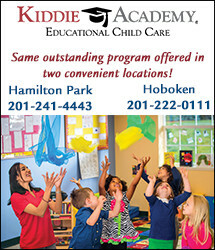 The event will be hosted at the Reeves-Reed Arboretum which can be found at 165 Hobart Ave, Summit. Calling all Harry Potter fans! Grab your wands and time turners and embark on a journey to where the magic and myth began! Capturing the traditions of folklore and magic at the heart of the Harry Potter stories, Harry Potter: A History of Magic, a British Library exhibition brings the magic to life! Tickets start at $21 for adults; $16 for seniors (65+); $13 for students; $6 for kids ages 5-13; free ages 0-4. Tickets also include admission to the museum. It’s all about the kids at this free Halloween party taking place at St Paul’s Episcopal Church located at 38 Duncan Ave in Jersey City! 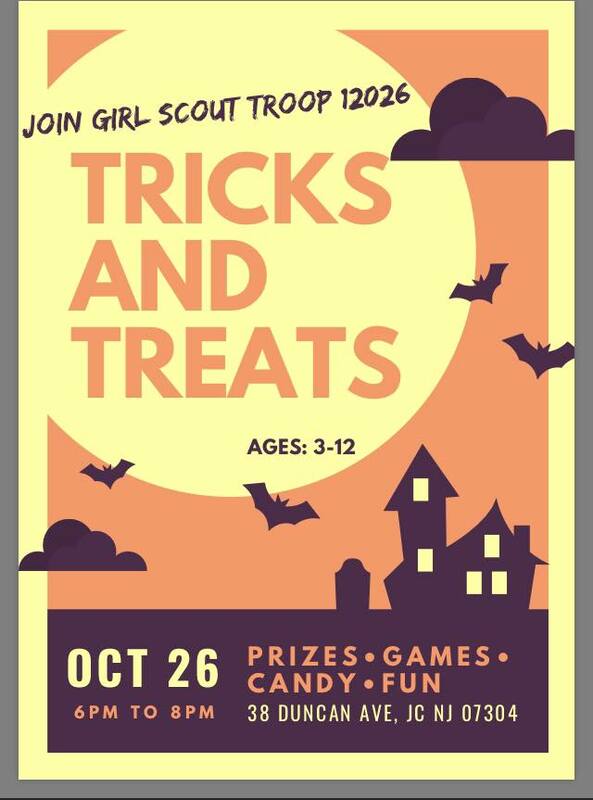 Girl Scout Troop 12026 invites you to attend their Halloween Party for the community. Ages 3-12 only. They will have crafts, costume contest, snacks and more. Be prepared for all things that go bump in the night when you enter the Harborside Atrium on October 27th. 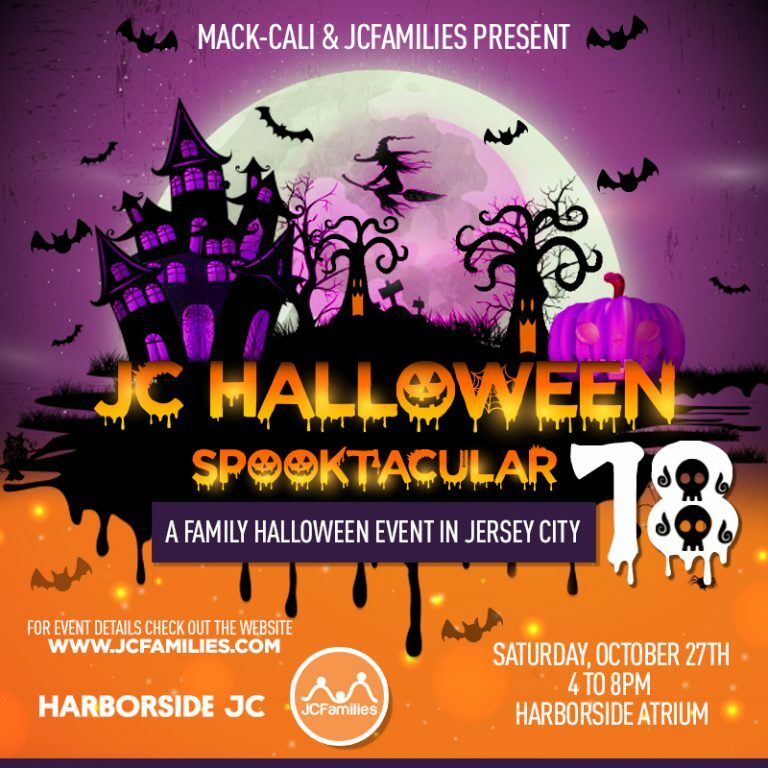 JCFamilies presents their 2018 Halloween Spooktacular! For $5 (for ages 6 and up) you can enjoy a costume competition, dance party, face painting, arts and crafts, carnival games and other entertainment for the kids! Make sure to stop by the picture corner to snap a spooky family photo! The American Museum of Natural History opens its doors for the eerie and creepy! With more than 30 Museum halls open for the event, guests are invited to wander among “ferocious” dinosaurs and the “mysterious” universe for trick-or-treating, arts and crafts, and fun with roaming cartoon characters, stilt-walkers, and balloon artists. Tickets are $16 per person and $13 for Museum Members. 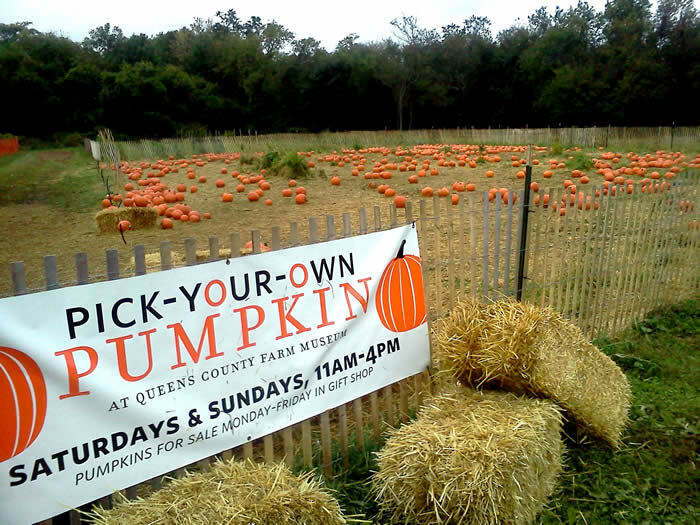 Dress in your Halloween best for this event located at Queens County Farm Museum! Kids will have a blast bouncing in the bounce houses, enjoying the pie-eating contests and more. 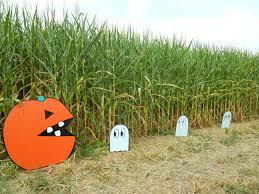 Do the Monster Mash to music, take an autumn hayride, visit the Haunted House and enjoy a pony ride and farm animals. For $20 a person you and your family can enjoy all the attractions available. There will be food vendors on site! 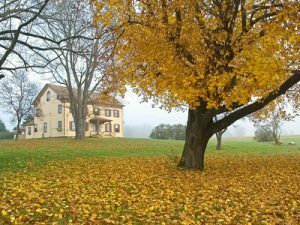 Queens County Farm Museum has a long list of fall events to choose from! Make sure you bring your reusable bags because you’ll surely leave with the fresh fruits, produce and baked goods from the Hamilton Farmers Market. 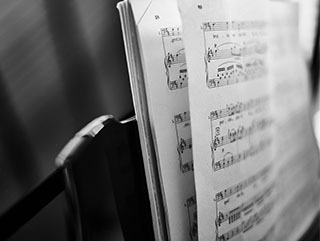 There will be live entertainment on the first Wednesday of every month and every third Wednesday is Pop-Up-Wednesday! 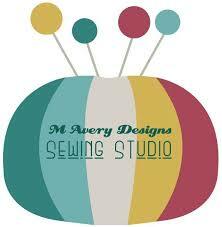 This allows artwork, craft and goods vendors the opportunity to showcase their work! If we didn’t some of these Halloween events might make you jump. Or dance. Or even laugh. We have something for everyone no matter where you stand on the scare meter! 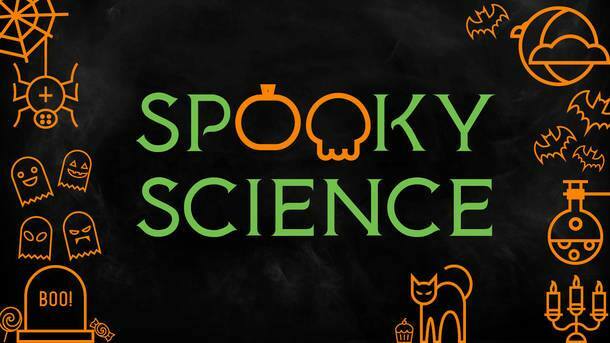 Tis the season to be spooky so check out our list of Halloween Events in Jersey City and Hoboken! Zaniac Jersey City is scaring up a good time STEAM style. You and your little one can build a haunted house with working lights. Channel your inner Dr. Frankenstein with circuits and LEGO monsters. If that isn’t enough, you can receive a prize if you come dressed in your first costume. 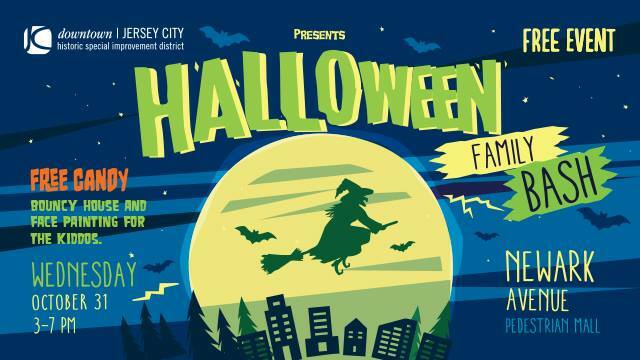 Come to Hamilton Park in your Halloween best for the Annual Halloween Parade in Jersey City! Families will be guided along the parade route by drummers, stilt walkers, and jugglers. The parade will commence at 5:30 pm and will take approximately 30-45 minutes to complete. 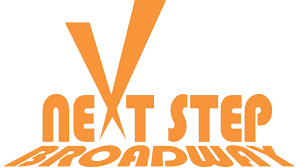 There will also face painters a DJ and performances by Nimbus Dance Works and Next Step Broadway Refuel with the on-sight food vendors and farmers markets! 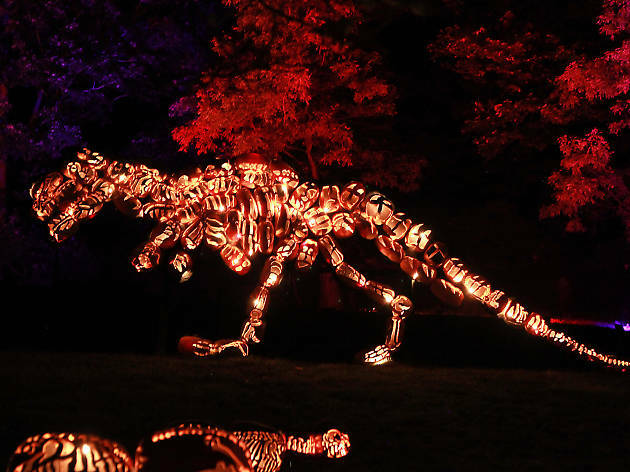 Enjoy a truly breathtaking display of more than 7,000 illuminated jack o’ lanterns—all designed and hand-carved on site by a team of talented artisans! Stroll across the Pumpkin Zee Bridge, watch our Pumpkin Carousel twirl, gaze in wonder at swimming aquatic creatures and a giant Sea Serpent. Get mesmerized by a color-changing star show in the Pumpkin Planetarium. Discover an awe-inspiring jack o’lantern Statue of Liberty rising to the sky! Tickets are selling out fast so make sure you get yours soon! 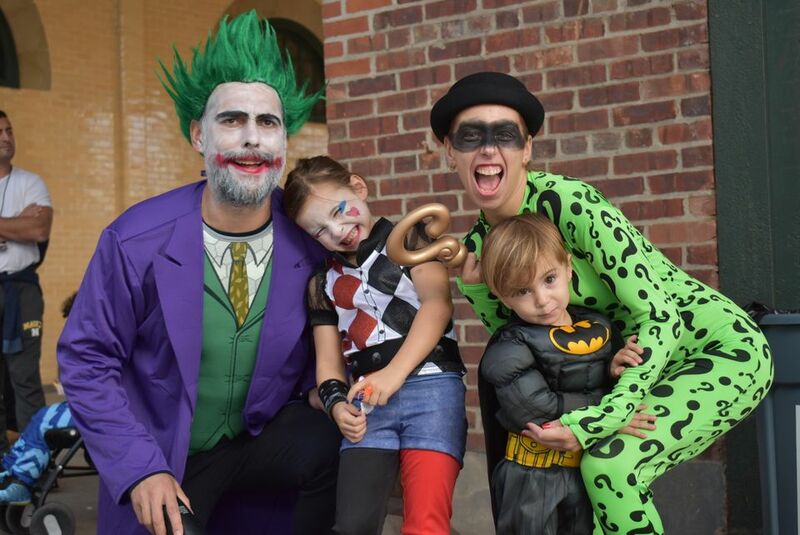 Do the Monster Mash, participate in Halloween themed arts and crafts, carnival games, and so much more during the Family Halloween Party and Parade in Hoboken! 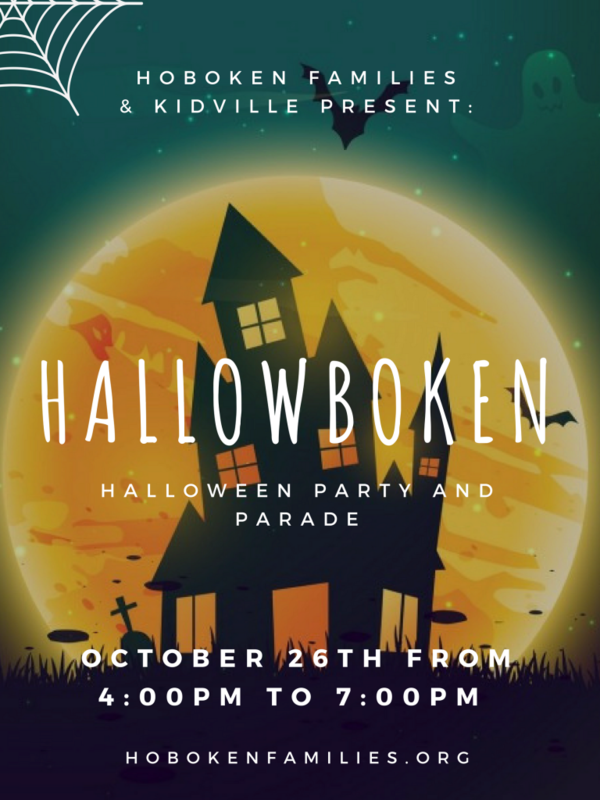 Join Hoboken Families and Kidville as they celebrate the season of ghouls, goblins and ghosts! Oh did we mention this event was free.99! Girl Scout Troop 12026 invites you to attend their free Halloween Party for the community. 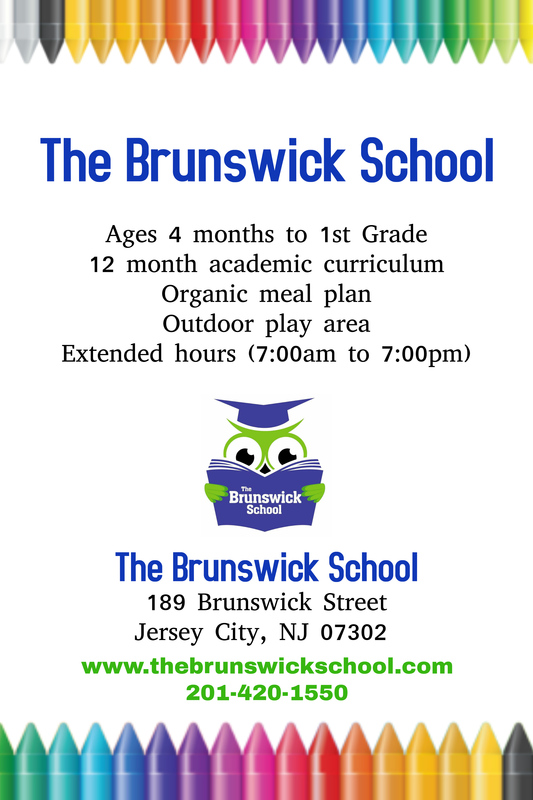 Ages 3-12 only. They will have crafts, a costume contest, snacks and more! 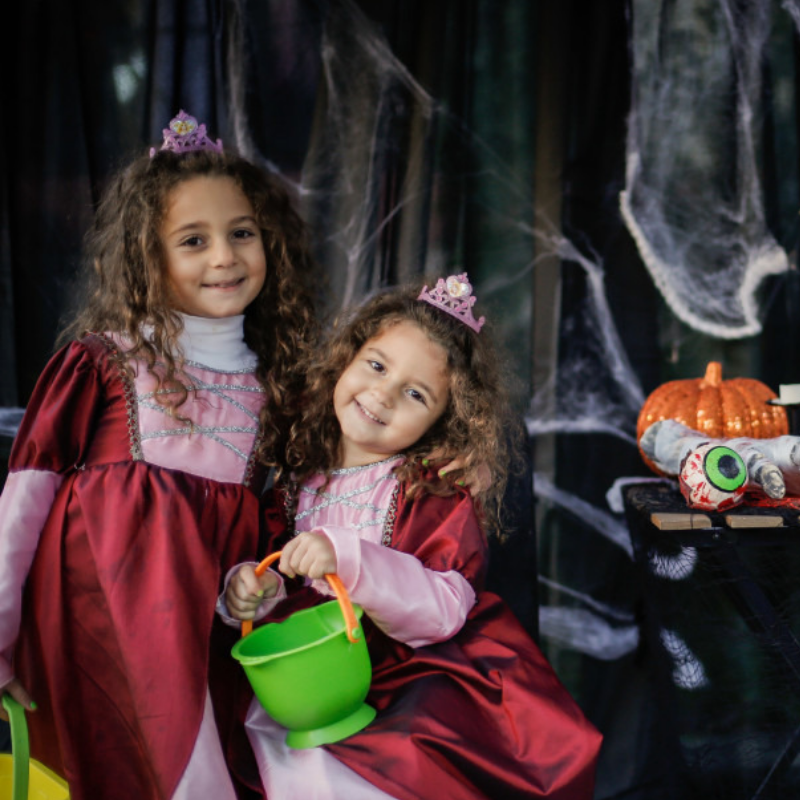 Bring your costume-clad kids for a FANGtastic afternoon at the family-friendly Brookfield Place Halloween Bash! Enjoy performances by Brooklyn’s own The Pop-Ups and learn how ghosts have the ability to fly! 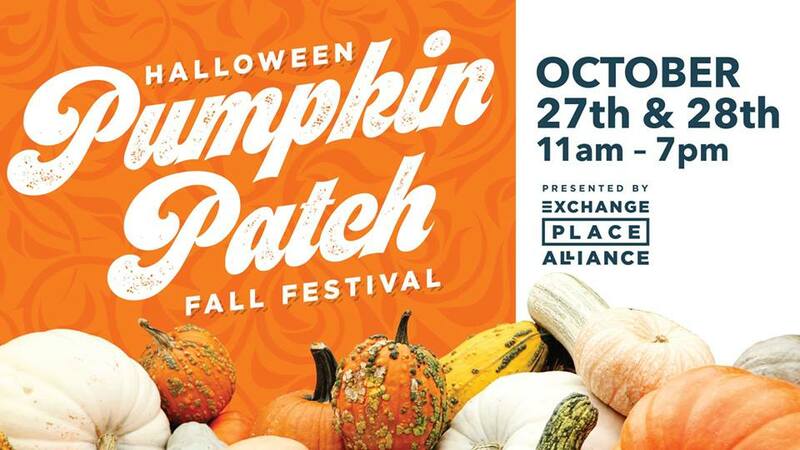 The Exchange Place Alliance will celebrate Halloween and the Fall season with a spectacular pumpkin patch, bounce house, magic shows and more! Terminal of Terror and Spooky Terminal is Jersey City’s biggest annual family-friendly Halloween event featuring tons of activities! The event is spilt into two part. 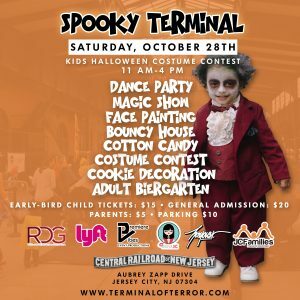 Spooky Terminal is a great opportunity for kids and parents alike to experience fun activities, snack on something yummy from the amazing food trucks and Jersey City’s most adorable costume contest! The Spooky Terminal will start at 11 AM and end at 4PM. Get your tickets before they’re all gone! 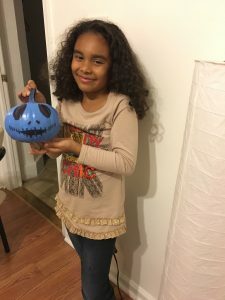 Halloween isn’t just for kids! Terminal of Terror is for the adults 21 and over and will feature celebrity & local DJs, fun activities, amazing food trucks, and an awesome costume contest with large cash prize! The fun begins at 9 PM and ends at 2 AM! Get your ticket here. 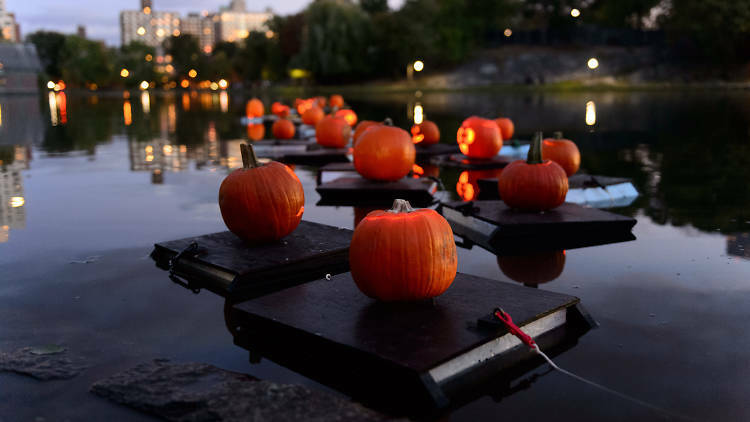 Central Park’s Halloween Pumpkin Flotilla is the only Halloween event that involves sending your homemade jack-o’-lanterns afloat into the Harlem Meer. 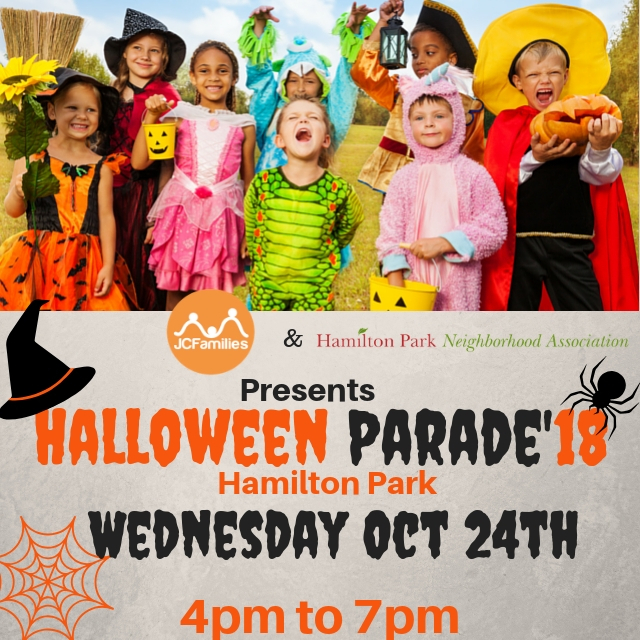 Before the main event at 6pm, kids are invited to show off their most creative costumes in a parade, dance to awesome music, listen to scary stories and work on creepy crafts. Learn more about the events’ lineup here. This is a free event! Mirror, mirror on the wall is your Halloween costume the scariest of them all? 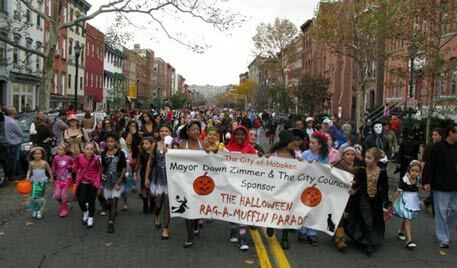 Grab your witch’s hat and your vampire fangs before attending the The Hoboken Ragamuffin Parade and Costume Contest! The parade will features local live music, floats, lots of great costumes and so much more! Have a ghoulishly good time on The Newark Ave Pedestrian Mall this Halloween! There will be face-painting, a bouncy house, music, popcorn and lots and lots of candy! This is a free event of families and if you’re interested in being a vendor for the event you can fill out a form here! Halloween is a fall season staple! 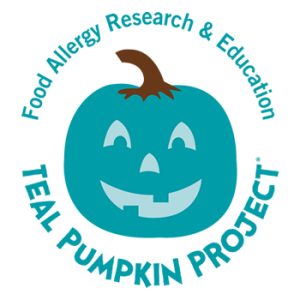 There are several amazing fall themed events and activities to enjoy leading up to this spooky week! There are few events happening in our neighborhood Hoboken, so check out the best five Halloween events there. 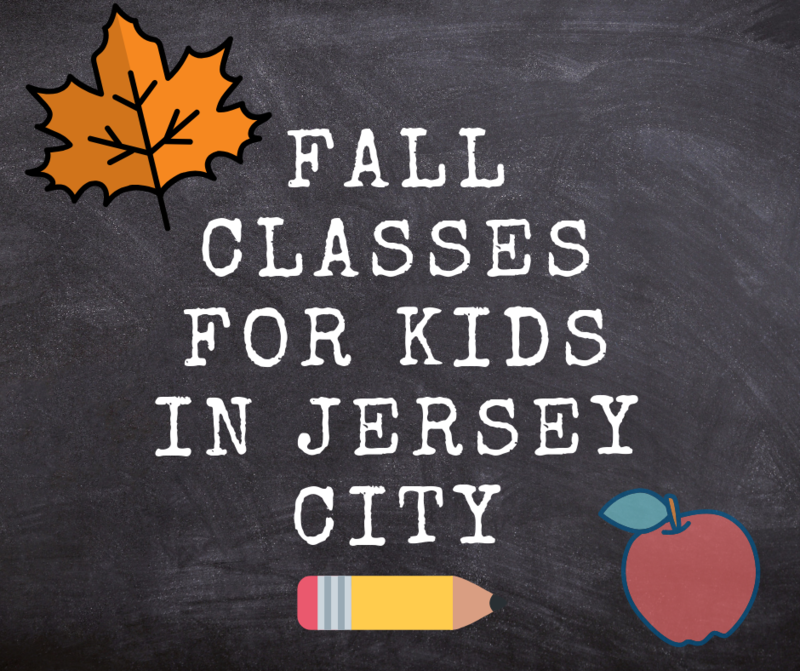 Let’s check out some of the best family events in Jersey City this fall. 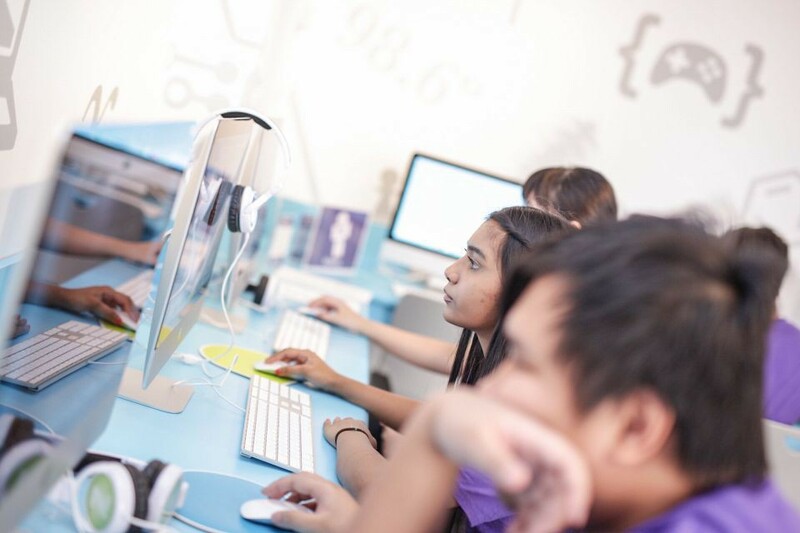 Whether you are looking for indoor activities, outdoor activities, educational activities, or something else, there are so may events for families and so many things to do in Jersey City. 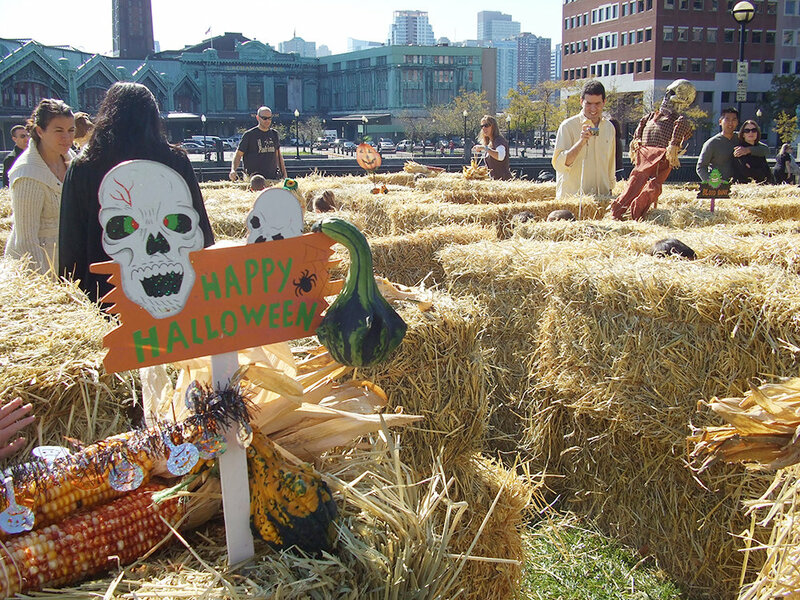 The Exchange Place Alliance will celebrate Halloween and the Fall season with a spectacular Hay Maze and Pumpkin Patch on October 21st-22nd and 28th-29th from 11 am – 7 pm. 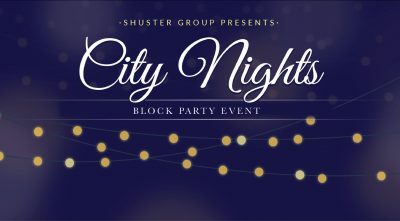 Shuster Group presents the 2nd Annual Block Party event, City Nights. Join us for a chic, adult-only event with Live Music, Live Art, Local Food & Drink Vendors, and larger-than-life Games & Activities. The Spooky Terminal is BACK on October 28th this year ….. 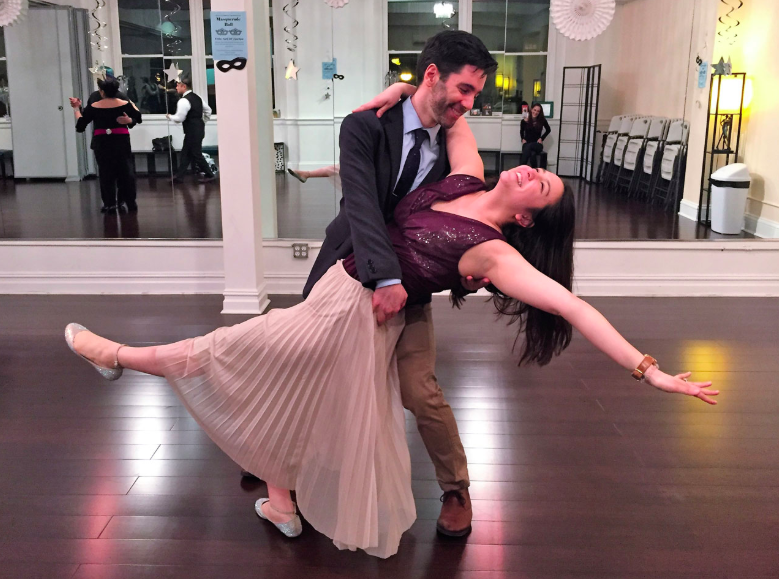 Located in a one of a kind venue over looking the gorgeous Manhattan skyline in the heart of Liberty State Park. All aboard!